Keep in mind that from the 1980s the SM-2 could be used as ASMs and they had the same range as the X-35 so with Mach 4 speed they would've been invincible to soviet AD, the only disadvantage being a small warhead. Can an anti-surface capability be done with the Buk and S-400? I doubt that- these things just dont pack that much punch- cause like you said rel. small warheads. Tho ofc. swapping the conventional ones with nukes would be devastating in case of a direct hit or near miss. Wonder what could it be? Military Industry Corporation (MIC) "NGOs engineering" state tests new cruise missile for the Navy of Russia, said General Director - General Designer Corporation Alexander Leonov. "In September, the state completed testing of a new cruise missile and two sets of ground-based and sea-based missiles, based on this" - said Alexey Leonov. He spoke at a ceremony to mark the 70th anniversary of the founding of the enterprise "NGOs engineering" Reutov. Onix has been in service for quite some time. I dont know perhaps it is but Im not sure. I think I remember hearing that Zircon would undergo it's first tests in 2014, but I'm going to make a wild guess and say it's not Zircon. It definitely isn't Onyx... that is what Yakhont is based upon and has been exported to several countries already... not to mention it is what Brahmos is based upon. A new cruise missile with two sets of land and sea launched missiles. I would have to say by the description that they have the land and sea versions of the subsonic and supersonic land attack/anti ship KLUB missiles sorted and ready for service. the export models are 3M-54E and 3M-14E. Of course the domestic models are 2,500km range for the subsonic all the way, and perhaps up to 1,500km for the subsonic most of the way and high supersonic for the last portion missiles. The only other option is that Onyx has now been replaced with Zircon.... both are quite exciting. This is the large 4 shot missile launcher used in the original Krivak class frigates. This is a later model missile, the early missile was a lot like the Australian Ikara in that it was a rocket with a torpedo slung under it. The difference was that the first model Silex missile was a fully dual purpose weapon with built in radar guidance. In the anti sub role, which was its primary role, the missile flew a ballistic path to the suspected location of the enemy sub and when it got there it dropped a torpedo into the water which spiralled down in the water listening for sub targets... when it spotted one it powered up its propulsion system and turned on its active sonar seeker and chased the target to impact. In its anti ship role in the main body of the missile there was a radar seeker and a 300kg HE warhead. The torpedo was not released before impact and its warhead and fuel provided the extra power to sink a ship by providing extra explosive for the blast and extra fuel for incendiary effect. The ship was seen as unbalanced in the west because "it was considered vulnerable to even a WWII Gearing class destroyer". Of course in the anti ship mode the Silex would have easily dealt with most WWII destroyers. Later models of the missiles retained the anti ship capabilities but added IR as well as radar guidance to improve their anti ship performance. 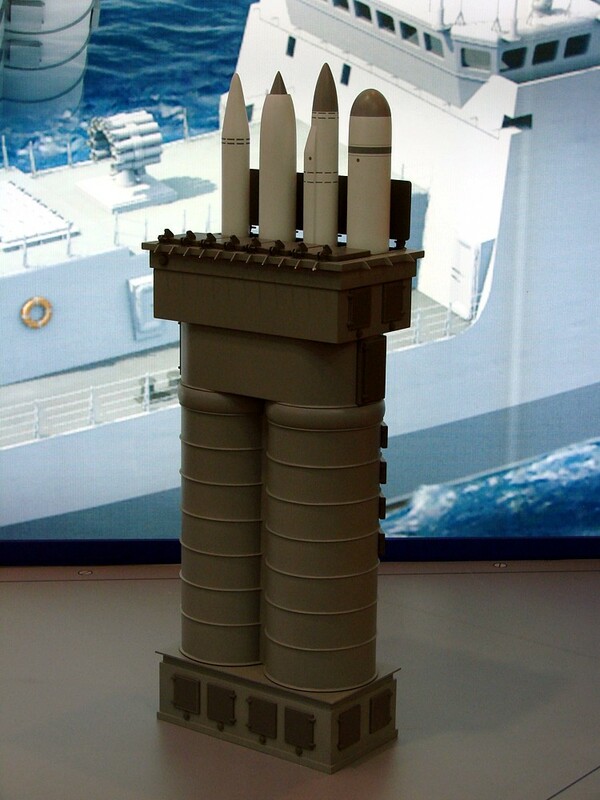 This is the UKSK vertical launcher which is fitted to the newer versions of the Krivak Class vessels and one launcher replacing the old 4 tube launcher alone is a large step up in capability. Though the anti sub Klub missile is not a dual anti ship anti Sub weapon with 8 tubes the new vessels can have the anti sub klub missile that is every bit as capable as the Silex in anti sub use though probably better with its newer model more capable torpedo payload, in the remaining 4 tubes it could carry Oniks or Brahmos which of course have significantly higher anti ship performance than the subsonic Silex. Equally the tubes can be loaded with land attack cruise missiles, and subsonic and supersonic versions of the Klub system. Kresta II, Kara , udaloy I are very weak in this anti-ship department and outmatched against Harpoon armed ships.What was the plan of the soviets later Russians if they were to battle harpoon armed ships ? Even though these ships were ASW ships but they can be encounter surface threats as well,As the Harpoon armed ship has the advantage of a longer range, what can the Rastrub armed ship do to survive ? nastle77 wrote: Kresta II, Kara , udaloy I are very weak in this anti-ship department and outmatched against Harpoon armed ships.What was the plan of the soviets later Russians if they were to battle harpoon armed ships ? Even though these ships were ASW ships but they can be encounter surface threats as well,As the Harpoon armed ship has the advantage of a longer range, what can the Rastrub armed ship do to survive ? They will travel together in task force with Sovremenny. Kynda or other ship that carry anti ship weapons. isn't it better to have multipurpose vessels like JNSDF in the region ? Yes, it is much better, cheaper and easier to maintain. Problem with Russia and its MIC, as well as generals is that there are too many of them, too many of them incapable of thinking properly, and they lobby for each project. So the shipbuilding industry has all these types of surface ship designs yet they cannot get a single one out on time or working properly because they are biting FAR more they can chew. In reality, having a single type of costal ships using similar weapons/equipment (of course in smaller numbers) to protect Russia's cost, then having a single type of frigates and destroyers to help provide longer range operations. Similar weapons makes it cheaper, helps deal with the bugs, reduces time/costs in development and thus they could probably get ships out on time, on budget and in good quality. But of course, that wont happen. Because it is so much better to have 5 different type of corvettes, two different types of frigates being developed, all with different types of sub systems for even similar types. Was ASROC as good as GRANIT? It is an anti sub weapon and would only be used against surface ships in self defence. Udaloys don't have vertical launchers. So it will be a radical renovation i guess. So how costly it will be? Udaloy is an anti sub destroyer... why do you think it should be able to sink US destroyers? Can I criticise the USS Nimitz because it can't operate at the same depths that a Kilo class sub can? BTW Of course western experts are going to say subsonic anti ship missiles are better than supersonic ones... until they introduced smoothbore main guns on tanks they were inaccurate too, and while they don't use autoloaders in their tanks that is a serious problem as well. the main problem with old Soviet supersonic anti ship missiles was they were huge and expensive and only a couple of Soviet vessels actually carried them and they didn't carry them in large numbers. With every Russian vessel being equipped with UKSK launchers however that argument is moot, not to mention land based launchers and aircraft launched missiles as well. Soon hypersonic missiles will make the gap even bigger... and the Russians also have subsonic missiles too in the form of the Kh-35 and Klub. Having specialised anti sub vessels was a necessity, not a choice. Togay modern Russian vessels will be fully multirole thanks to UKSK. GarryB wrote: Udaloy is an anti sub destroyer... why do you think it should be able to sink US destroyers? was specialized ships or aircraft neccesarily a bad thing ? For anti ship use the Kirov class vessels carried the 7 ton Granit... ie SS-N-19 SHIPWRECK... it also carried the SSN-14 SILEX, but it was a cruiser and had the space for such large weapons. 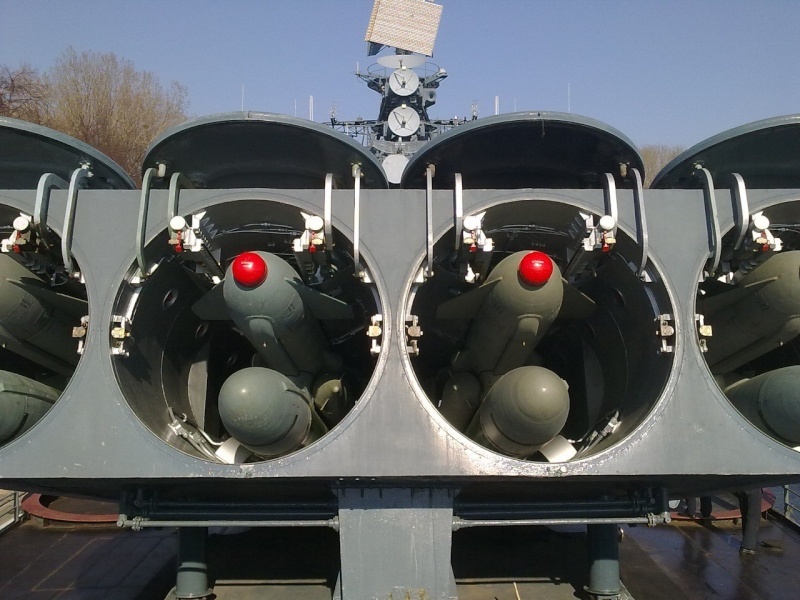 For the Udaloy, the 8 SS-N-14 missiles took up the space of the 8 SS-N-22 anti ship missiles on the Sovremmeny... the choice is either to have 4 missiles of each type on a multi purpose anti ship anti sub destroyer or to have two ships... ASW and AShW. they did the latter. The different vessels were totally different with different weapons and sensors and propulsion to perfectly suit their different missions. today such a destroyer would have 4 UKSK launchers which could have any combination of anti ship, anti sub, and also land attack cruise missiles in them... with 8 tubes each that is 32 missiles in any combination... so a new destroyer could carry 8 Onyx missiles that replaced the Granit and Moskit, plus it can have 8 Klub ballistic rocket propelled torpedoes the replacement for Silex, and still have 16 tubes free for the same number again to have the fire power of 2 Sovremmeny class destroyers and 2 Udaloy class destroyers... or it could carry Brahmos and Klub anti ship missiles or various land attack missiles to give it a land attack capability no Soviet or Russian vessel has ever possessed. The MiG-29M or SMT could perform the short and medium range interception roles of the MiG-21 and MiG-23, and also the short to medium range attack roles of the MiG-27 and Su-17. Yeah, but the anti-ship missiles will have a much lower range than before. You are forced to go supersonic to defeat modern ship AD, but supersonic gives you massive range penalty. So, no more 900 kilometer range anti-ship cruise missiles. Which is both a blessing and a curse, I guess, since for 900 km range you kinda have to have a RORSAT, since without targeting you are limited to horizon. Another pro/contra moment of new missile is warhead size. P-800 warhead is 2-3 times smaller than the one on P-500/P-700, so it has no chance of sinking a capital ship alone without going nuclear. And before you mention swarming, it is a method of punching through the AD, not of adding extra TNT. 6-12 missile swarm is there to make sure 1-2 missiles get through, but it's those 2 remaining vampires will be doing the heavy lifting. Which is incidentally why P-800 was never intended to be used against aircraft carriers when it was developed in the 80's, it was purely a destroyer/cruiser level missile (and yes, those kind of parameters WERE actually put into requirements). ASMs such as Onyx are completely networked and have a very good range for homing (search and lock ranges). P.S. Wait till M=5+ hypersonic ASMs go online. I say about another 3-4 years at most. Prototypes are already flying.You may track the evolution of the ASMs into the formidable weapon they are from P-700 Granit. This was a revolutionary weapon. Basically outlines consideration and design of anti ship missile. This seems explain well why US stick with Harpoon for so long and replace it with another subsonic LRASM-A and Kongsberg NSM. Can anybody explain that technical link in layman terms as to why usa naval consider subsonic asms ? Any chance of Kh-35 being integrated into UKSK? I would not say that exactly... many of the members of Klub... the subsonic all the way anti ship missile supposedly has a very long range, and the subsonic most of the way and supersonic last leg anti ship missile I have read has a range of about 1,500km or so. But you could argue that the 500km range of the Granit and the 120km range of the Sunburn were the 1980s options while the much smaller lighter Onyx likely has a range of about 500km at most so the range performance has not changed a huge amount in some cases. ALlthough another aspect is the the C4IR should have been extensively upgraded too... the biggest change is the most dramatic is the 2,500km + conventional ground attack capability that the Russian Navy has never had before. But then the logic behind such decisions are pretty sound... the US carrier group with AEW air support and AEGIS support meant just going with lots and lots of subsonic missiles was never going to cut it... assuming the missiles would be detected at long range the solution they took was speed to reduce reaction time... the cost being big heavy missiles that few platforms could carry. The newer much lighter missiles means larger numbers carried and higher chances of defence layer penetration. Speed increases chances of getting through... but so does numbers... speed and numbers. For Russias client states then land based anti ship missiles with a range of only 300km would be fine. For export or as part of a swarm concept where 4-6 missiles are loaded per tube in a way that they are all launched in a cannister that then releases them all in one shot. Or perhaps a structure that allows each to be fired individually that fits in the tube. One issue that is often overlooked is that it is not actually necessary to sink an enemy warship with an AShM, but only disable it and prevent it from carrying out its function. Hit a carrier with an Onyx and you will likely prevent it from launching and recovering aircraft, and that essentially makes the hit a mission kill. In WW2, carriers were taken out of action with only a single bomb thru the flight deck, and I cannot believe that a Nimitz-class carrier with a big blast hole in its flight deck, or listing to port by 10 degrees can continue to operate effectively. Disable enough of a USN CBG with long-range AShMs and suppress its air-superiority capabilities, and it becomes far more susceptible for follow-up attacks, especially once its carrier-borne fighters and AWACs are no longer operable. Take down a CBGs ability to adequately defend itself and it can be ground down at your leisure. Are we at the stage yet where AShM are smart and manoeuvrable enough to identify and locate the target and then attack it, not from the broadside but from the front or rear? The big and fast Russian missiles would do a lot more damage that way. Bit like the British at Trafalgar sending cannon balls along the French/Spanish gun decks rather than across them. There is no supersonic Kalibr, it was just something Novator came up with for export customers, but I've heard from some reliable sources that none for built for Russian Navy and only Oniks is being used as a supersonic anti-ship missile. And the 1500-1250 km version is the land-attack subsonic version. Also, I highly doubt Oniks has 500 km range. No real number has been revealed and my bet is it's somewhere close to 350-400 km based on missile size/engine type. Attacking land-targets from 2500 km is not and has never been an issue. Inertial navigation, topographic maps and terrain contour mapping is a thing. Attacking sea targets from 2500 km is a fantasy, if anyone tells you that such capability exists today, don't believe them. artjomh wrote: [*]There is no supersonic Kalibr, it was just something Novator came up with for export customers, but I've heard from some reliable sources that none for built for Russian Navy and only Oniks is being used as a supersonic anti-ship missile. And the 1500-1250 km version is the land-attack subsonic version. I call BS on this, aren't there supposed to be domestic supersonic variants of the missile? In fact I don't think there even is a domestic subsonic anti-ship variant. The Project 20386 design for the Russian navy, has both Uran quad-launchers, and Klub missile containers with Klub-K missiles stored below deck, with part of the deck above sliding away to enable launch. Why would this design bother with this elaborate system, just for the sake of supporting 2 different types of subsonic missile? Bal coastal missile system is in service and uses Urans. The Uran is designated as a missile for use against < 5000t vessels. It's smaller than the Kalibr and can fit into ships the full-size Kalibrs can't. The angled quad launcher comes in handy too; they've been fitting them to all sorts of places where UKSK VLS would be awkward to place; notably in the Steregushchy and Project 20386 designs. It's more than likely cheaper too. All in all, it's a compact, cheaper subsonic missile that is suitable for arming smaller vessels that can't afford the space for UKSK VLC cells or aren't expected to face threats that would justify possessing such capabilties. [*]Attacking land-targets from 2500 km is not and has never been an issue. Inertial navigation, topographic maps and terrain contour mapping is a thing. Attacking sea targets from 2500 km is a fantasy, if anyone tells you that such capability exists today, don't believe them. Except that the Russian Navy never had the capability to launch a conventional missile strike against a land target until fairly recently. All it's missiles for land-attack throughout the Cold War period were nuclear-only.